The trailhead is well marked and just next to the parking lot. And well, yes, there is a designated parking lot with ample parking space! (You would know what I’m talking about if you’ve read my earlier hiking posts and our troubles with either overcrowded or non-existent parking lots). At the trailhead, we took the trail on the left – the Ridge Trail. The trail on the right is the Ipiwa Trail, the one we would be returning on to complete the loop. Just after 250 meters, we hit another parking lot – this one was accessible, for the disabled. Here, we switched to the Horseshoe Loop Trail, which took us on the inner U of the horseshoe bend. The trail path was littered with fall leaves. The dried leaves crushing under our footsteps provided surreal forest vibes. After a little more than a half mile on this trail and a slight climb, we reached a picnic area overlooking the Horseshoe Lake. This is a perfect spot to take a rest break on a hike, especially if one were doing the loop in the opposite direction. We, of course, had just started the trek. So we just spent a moment taking in the tranquility of this place. For future reference, we made a mental bookmark of this spot for picnicking and relaxing (Shade of trees, check. By a lake, check.). As we continued on this trail, we were rewarded with scenic glimpses of the Horseshoe Lake. The prettiest part of the Horseshoe Loop Trail is this last leg of the horseshoe bend, right around the tip of the outer U, just before you come out of the tree cover and are in full view of the lake. 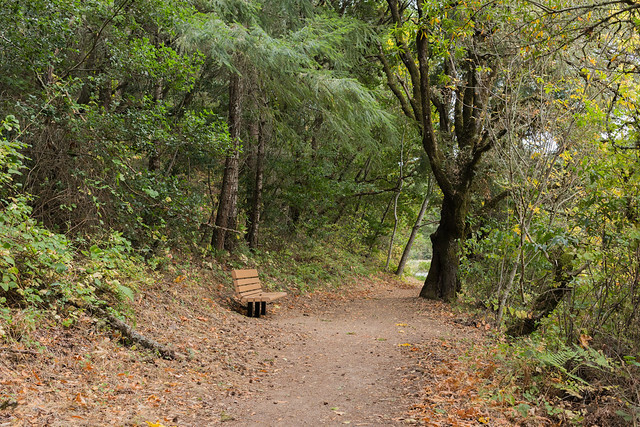 There are two benches on this part of the trail, positioned perfectly facing the lake and under a nice cover of trees; they looked so tempting – I felt like stopping right there, sitting down and indulging in some reading, and not worrying about time. Ah! there went another mental bookmark! Soon after, there was a fork in the trail. Taking the right trail and continuing on the Horseshoe Loop Trail would have led us back to the accessible parking lot. 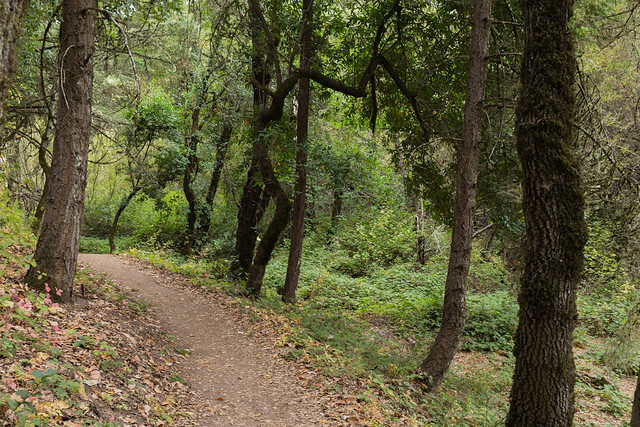 The Horseshoe Loop Trail by itself is a 1.4 mi loop (from the main parking lot). We took the trail on the left, which after about 200 meters brought us to another fork. Here again, the right trail leads to the accessible parking lot. 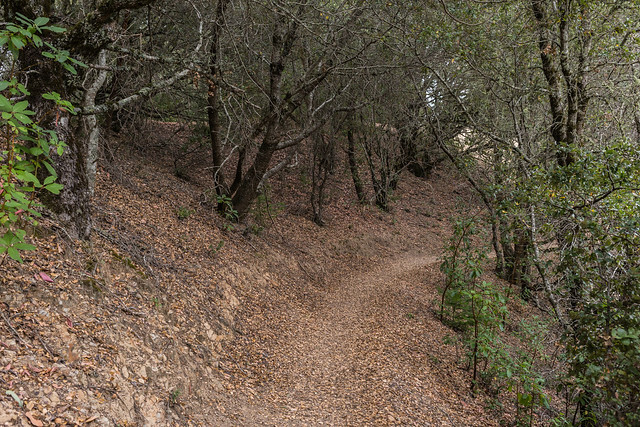 We took the one on the left, the Sunny Jim Trail. Here onward, the rest of the bigger loop that we intended to walk was completely exposed. Thankfully, there was no sun that day! 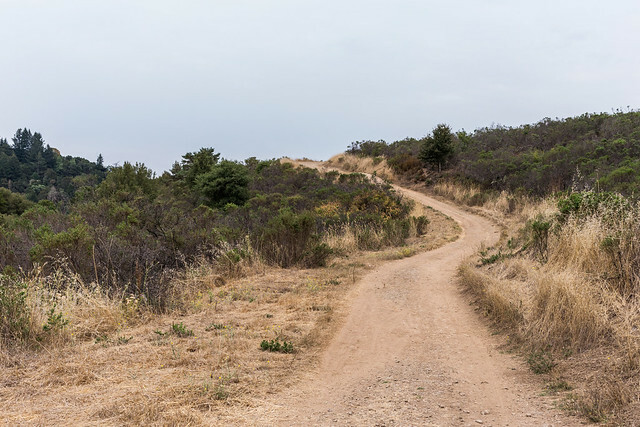 A mile hike on this stretch of the Ipiwa Trail kept us breathless, both with the panoramic views and the gradual ascent. We could tolerate the latter for the former. 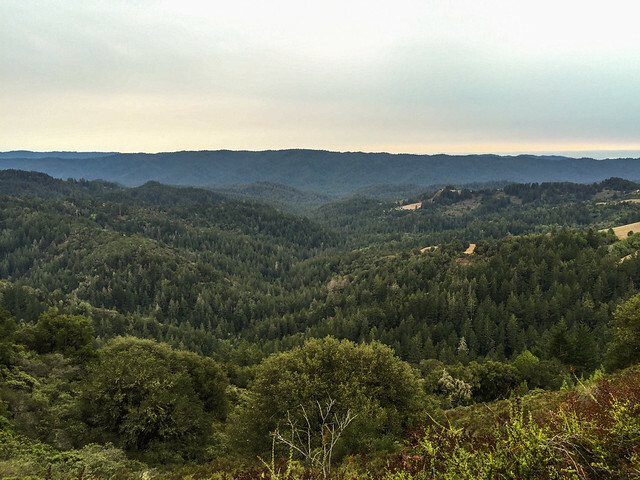 Seriously, this expanse of forests (state parks) and lush trees with the Santa Cruz mountains rising high in the far distance will take your breath away. Below is a 3D view of that area (snapped from Google Maps). 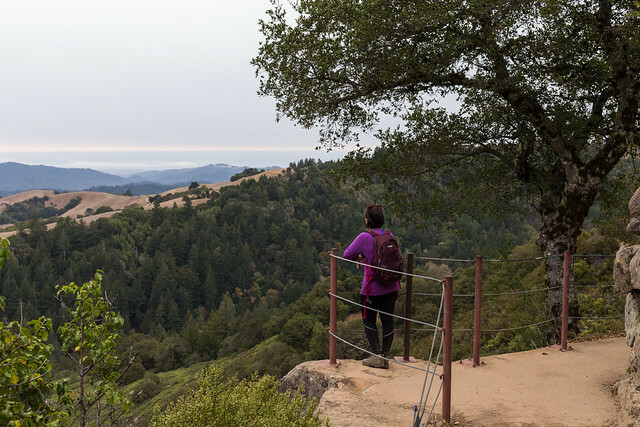 The green expanse we were looking at were the Pescadero Creek Park, the Butano State Park, and the Portola Redwoods State Park. 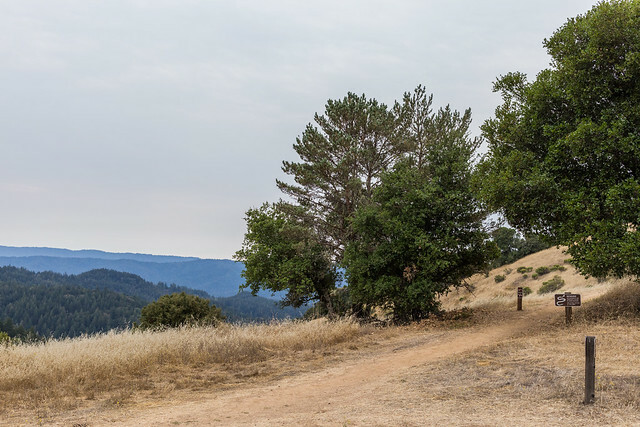 We were glad to reach this vista point (Gene Sheehan Overlook) on the Ipiwa Trail, which is a fantastic lookout point to really stop and savor the views. We would probably hike this route again just to get to this overlook and enjoy the spectacular vistas. As we treaded along on the Ipiwa Trail, we again entered a tree-covered region. This was where the trail had more or less leveled out. 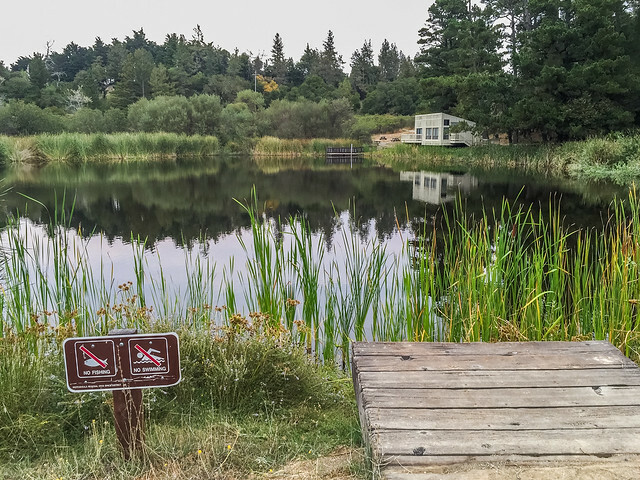 After a few meanderings, the trail led us to the man-made Alpine Pond. We took a breather here. It was the midpoint of our hike. A family with two kids was taking a snack break at a nearby bench. Incredible how the wilderness is kept intact with the addition of these small amenities. I later looked up online and noticed that there is a shorter way to reach the Alpine Pond. 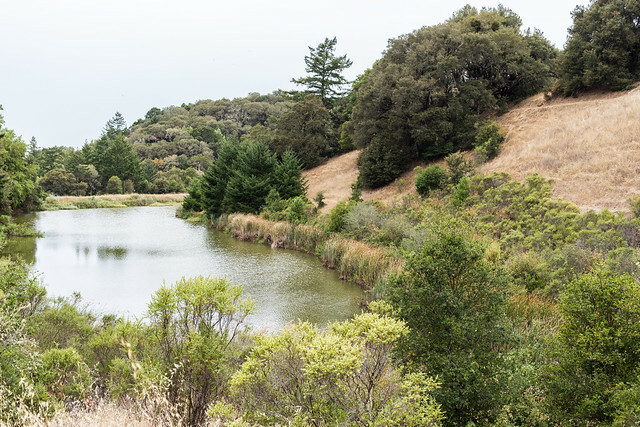 One could park at the adjoining Russian Ridge Open Space Preserve parking lot and the pond is just 250 meters from there. 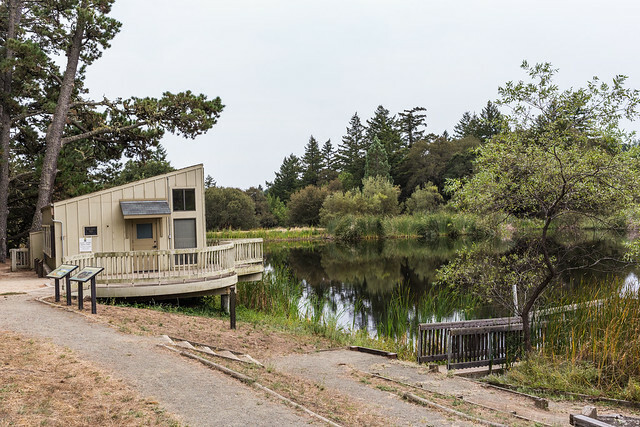 Perched at one corner of the pond is the David C. Daniels Nature Center, which is a great information hub for both kids and adults to learn about the nature and wildlife in and around the pond. The Center had closed by the time we got there. It is open only on weekends. 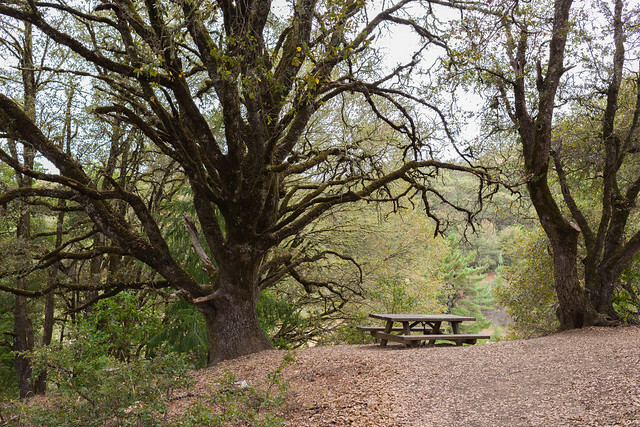 There are a couple of picnic tables and benches next to the nature center. After a stroll on the Pond Loop Trail around the Alpine Pond, we started on our way back: a small stretch of Ipiwa Trail (different from the one we came on) and then Sunny Jim Trail. All shaded and pleasant till here. 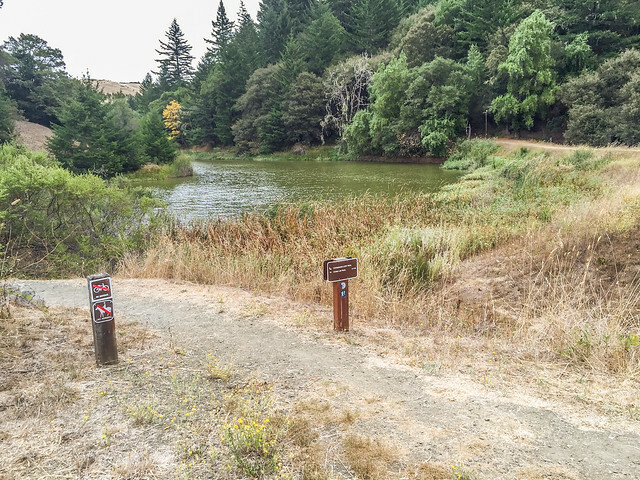 We again reached a point where we had the option to continue on Sunny Jim Trail or take the Butano View Trail. We took the latter, though I don’t remember now why we chose that. It was a steep incline. 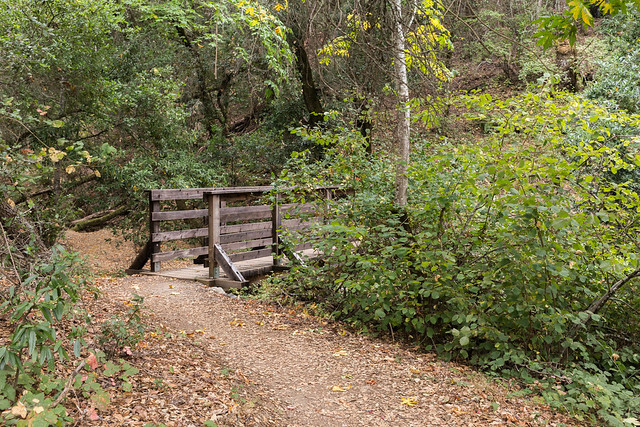 After approximately half a mile of Butano View Trail, we were back on the Sunny Jim Trail and it was all downhill from there. 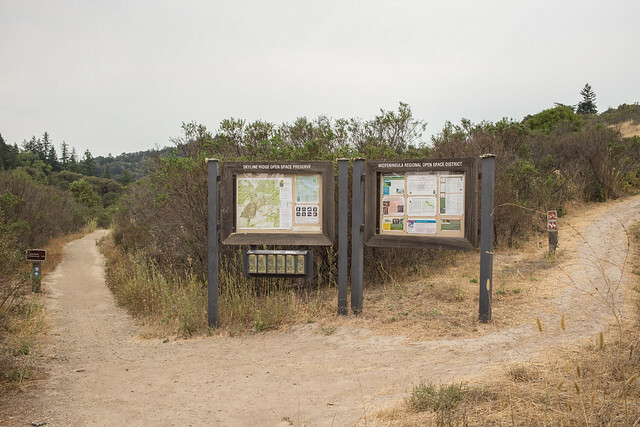 We encountered the same four-way junction, the intersection of Ipiwa Trail and Sunny Jim Trail. We picked up Ipiwa Trail back to the parking lot. Parking Lot: There are ample parking lots at the trailhead. 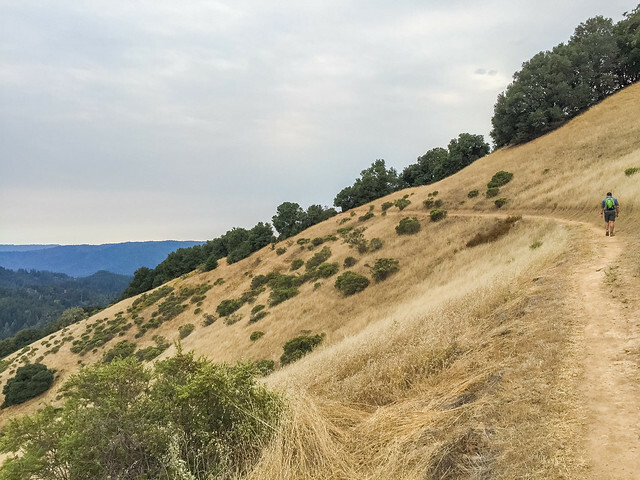 Alternatively, you could park at the Russian Ridge OSP parking lot and hike this loop in reverse. Restrooms: Restrooms are available at the trailhead, next to the parking lot. (Also there at the Russian Ridge OSP parking lot). Map: Available for free at the trailhead. Exposure to sun: Some parts shaded (Horseshoe Loop Trail, Pond Loop Trail), some parts exposed (Ipiwa Trail, Sunny Jim Trail). Crowd: Sparse, even on weekends. A few folks with kids are always around at the Nature Center during the center's operating hours (weekends only).